The Bayou Fitness Total Trainer Power Pro Home Gym provides weight resistance and flexibility training. The system uses your body weight for resistance. However, the power bar allows adding approximately 100 pounds of free weights according to reviewers. Changing the glide board’s incline increases the percentage of body weight lifted, within a twelve-stage range from six percent to 72%. Strength-training attachments, an instruction manual, four program cards, and a strength-training DVD are also included. It’s one of our top picks of the best home gym of this year. The frame is constructed of heavy-duty aluminum. The resistance-training mechanism has a four-point, quick-release, dual side pulley system and uses roller bearings for smooth operation. The double-stitched glide board cushion measures 48′ long by 14″ wide and provides two-inch thick padding. The equipment supports a maximum of 500 pounds with a maximum user height is 80″. This product appeared on the market in 2008 and currently sells for $797.65 on Amazon.com. While this model has only been around since 2008, one highly satisfied reviewer reports having used a Bayou Fitness Total Trainer Pro for over 10 years. Most reviewers find the equipment to be well constructed, durable, and easy to set up use. 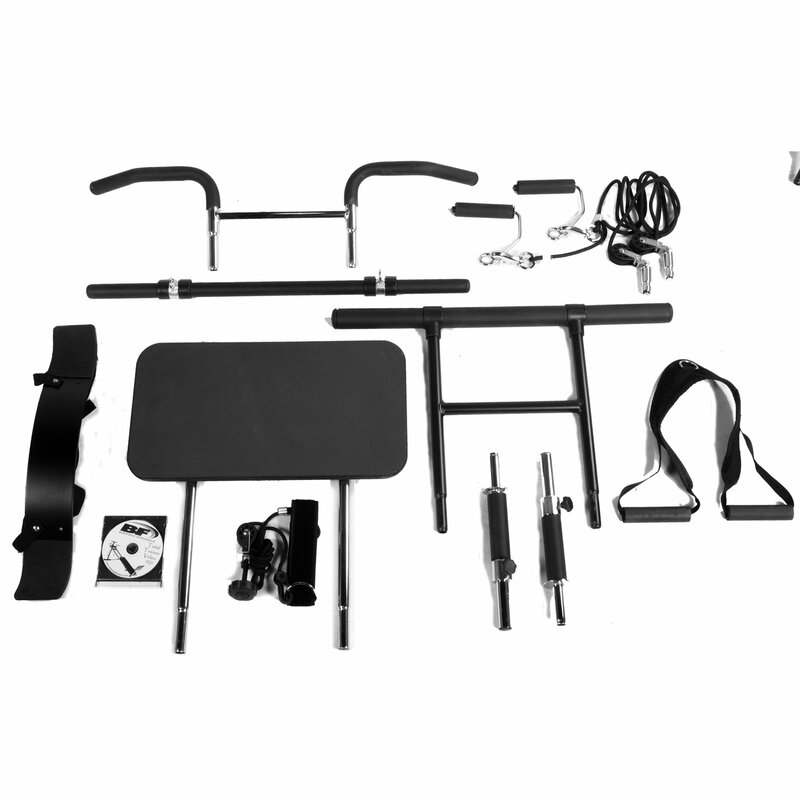 The strength-training attachments included with this home gym — bicep power flex, pro ab strap, bicep curl press bar, pull-up/push-up bar, foot trays, and squat board — allow users to engage in a circuit training routine that exercises arms, shoulders, chest, back, abs, quads, hamstrings, and calves, building lean muscle without bulk. Reviewers report using the equipment to improve and maintain general fitness, to improve and maintain performance in a variety of sports, and to improve fitness for participating in outdoor activities. Several reviewers report using the equipment to help recover from injuries, including back injuries. Reviewers favorably compare the Bayou Fitness Total Trainer Power Pro Home Gym PowerPro to other brands, including more expensive equipment, and pronounce it a much better value. The reviewers comment in particular on the natural feel of the range of motion allowed by the Power Pro in comparison to other products. Using body weight as resistance eliminates safety concerns over exercising alone using free weights. Including strength attachments — bicep power flex, pro ab strap, bicep curl press bar, pull-up/push-up bar, foot trays, and squat board with four training cards — increases the versatility of the equipment. Allows a more natural feeling full range of motion. Folds to a 24″ x 14″ footprint with a height of 52″ when not in use. Comes with over-sized casters for ease of moving the equipment from the storage area to your exercise area. The main complaint regarding the Bayou Fitness Total Trainer Power Pro Home Gym is its weight. The listed shipping weight is 143 pounds, unpacked it weighs 123 pounds. Keep in mind that, while some UPS and FedEx drivers do unload their trucks and help carry heavy packages, it is not their responsibility to do so. If the driver were to be injured while helping carry such a package, his or her company insurance might not pay for it. So, track your order, find out when it will be delivered, and have someone there to help you carry it inside. Some reviewers commented on a lack of detailed exercise instructions. While the four program cards and the DVD offer 14 customizable programs, one reviewer felt more advice on adapting programs for older adults was needed. Other reviewers commented that, at higher levels and after adding free weights to the Total Trainer, the footboard and the tubes that attach it to the frame begin to bend. Product is heavy for one person to move. Advice on adapting exercises for older adults missing. Instructions for exercises could be more detailed. Tubes attaching footboard to frame bend at higher exercise levels. People who were not bodybuilders but who participate in sports wrote most of the reviews for the Bayou Fitness Total Trainer Power Pro Home Gym PowerPro. They were experienced with exercise and either had owned other brands of home training equipment or had done a great deal of research before purchasing the Total Trainer. Reviewers compared the Total Trainer Power Pro to Bowflex, the Weider Crossbow, Nautilus equipment, and Chuck and Christie Norris’s Total Gym. These reviewers pronounced the Total Trainer to be an excellent value and superior to the other brands. Only a few reviewers. possibly those inexperienced with exercise, asked for more detailed exercise instructions. So, while it’s not for bulk-seeking bodybuilders, the Total Fitness Trainer offers a good solution to those seeking toning and lean muscle strength for active sports and outdoor activities.